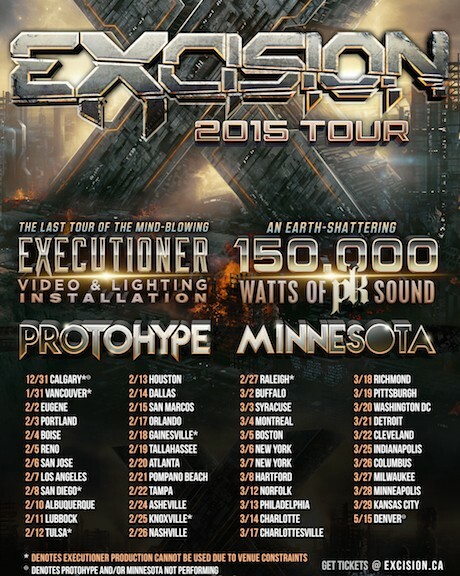 Excision, the Canadian bass music legend has one of the most demanding tour schedules in the industry, and is arguably one of the hardest working producers in the game. Always armed with a truly impressive display of dj skills, cutting edge stage production, unreleased new music and one of a kind immersive visual content, Excision brings you an experience like nothing else in the world of electronic music. 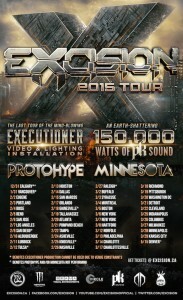 While X is smashing his way across North America, he will have at his disposal his infamous 150,000 watt PK sound system and the 15 foot tall, 28 foot wide, revolutionary video and lighting production known as The Executioner. This will be the final year The 420 sq foot Executioner will be used, and Excision plans on utilizing this custom stage installation to the fullest. Within the control center of the massive bass bunker, customized 3D video mapped visual sequences are controlled by Excision as he DJ’s both the audio and video transmissions broadcast to the crowd. The result is a full scale blast to mind and body, with relentless waves of earth shattering bass blasts, the way Excision’s music was designed to be heard. *Denotes The Executioner cannot be used to due venue constraints. If you are anywhere in the USA then dont miss out !! Why did you choose this style from all variety of music area in UK? The generation I grew up in was surrounded by electronic music of one form or another, starting with mainstream pop acts like Depeche Mode or Duran Duran and then evolving to Kraftwerk and then around the rave culture of Trance, early forms of Jungle, and Techno. It was really a natural thing that my passion would be some form of electronic music and Drum and Bass (and Breaks) brought a positive and happy style that I enjoyed. From what did you start in music? Where your passion comes from? I was part of the rave scene in the UK travelling across the south of England to outdoor raves to experience the enjoyment it brought to so many people at the time. Also by living in London I was exposed to a lot of the ‘trendsetting’ influences in music that all had the potential to be the next big thing in music culture. I never intended however to be a DJ. That came through 2 of my friends Joe and Lee who I met at a party in Bournemouth 10 years ago now and they were both mixing DnB and picking up the skills of being a DJ, and I decided to have a go myself. It all really progressed from there. Tell us about the philosophy of KRISIS DNB project. It all follows on from the previous question really. As I developed some skills at mixing, I was always listening to, and watching other DJs playing and picking up what I could along the way. That introduced me to DJ NeO who by chance happened to live 30mins away from me. We were both relative beginners in the music scene, but had similar skills in IT. 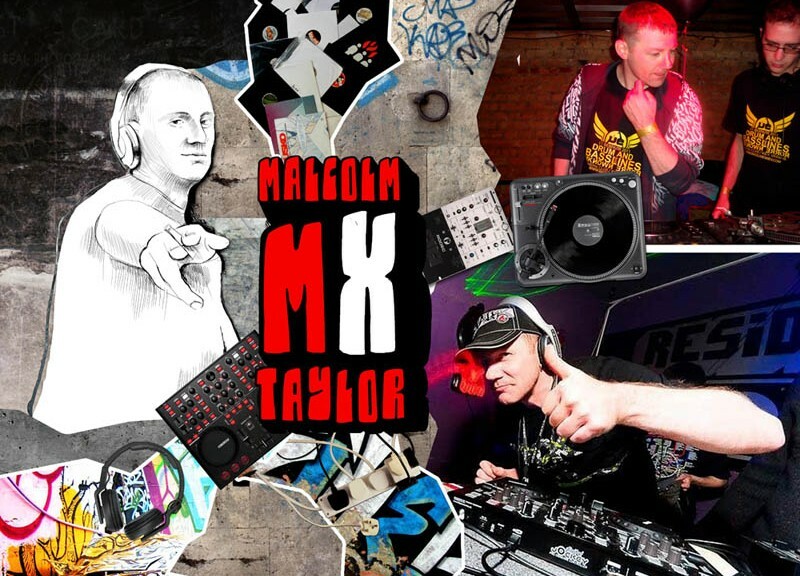 The combination of our interest in Drum and Bass, and our skills in IT worked well with Internet Radio and after playing on a few other small stations we made the decision that we could not only work the technology better, but give opportunities to other talented DJs to get themselves heard without the selfishness and politics that we had seen ourselves in the DnB (and probably other) genres of music. What do you think about the level of wellbeing of DNB comparing to other music styles? Is it close to Ukrainians’ mentality? I didn’t choose DnB because it was popular. As I said, in my youth I listened to a lot of styles of electronic music, but as I got into my 20s my positive outlook on life brought me to more uplifting styles that saw happy people having fun and enjoying what they were listening to. From what Ive seen in Ukraine in their social activities, I see a similar mentality to mine with people very positive and enjoying the music they love whatever style it may be. In fact I would say Ukraine is a lot more open with people enjoying a wider range of styles on a single night compared to the UK where nights tend to be focused on 1 thing be it DnB, or Dubstep, or Techno etc. Describe a person who listens to your music. How do you see him or her? Most people who have seen me perform should be able to see my passion is not just for DnB, but also Breaks and on occasions House and Trance as well. I think that’s why I have enjoyed being in Ukraine, Belarus and Georgia so much as people just enjoy themselves in the same way I do. Not long ago you had a concert in Donetsk. What did it go? What do you remember most of all? Living in Ukraine (and Belarus) off and on for the last 3 years has given me the opportunity to see so many new places, and being a football fan as well when Vovan invited me to come to play in one of the host cities for Euro 2012 it was something I jumped at. I know Vovan worked very hard on the preparations for the party, and to show me around Donetsk as well, including even bringing Bohdan to help translate for me, it all made an amazing weekend. Black and White club is a cool place and perfect for a Drum and Bass party, and everyone I met there from the DJs to the people who came enjoyed the night. Would you like to move to Donetsk? Are you going to come back to our city in the future? Living in Ukraine is not easy for an Englishman who can’t speak Russian or Ukranian. There are so many challenges I have being here from simple communication, to government rules which I don’t understand. Donetsk is only the 2nd city in Ukraine I had visited at the time (Kyiv being the other). Both are very different places, and each has its own characteristics which make it special. I like Kyiv for its history and monuments, and Donetsk for its slower pace of life, open space, and different sights compared to the capital Kyiv. Yes I will definitely come back to Donetsk when I am next in Ukraine !! Now you are on tour in Tbilisi, before that you visited Ukraine. How do you choose countries for tour schedule? My original goal 3 years ago was meet with DJs Red Catz and Yellow Int in Belarus as they had a regular show on KrisisDnB. That is what brought me to Eastern Europe. I saw it was important for me being the co-owner of KrisisDnB to get to know the other DJs on the station no matter where they are in the world. The path to Belarus was always through Ukraine and I made good friends with DJ Fade in Kyiv so it was a natural thing to visit and see more of Ukraine as well. In the same way DJ Alex Rayden from Tbilisi played on KrisisDnB and we became good friends really during the brief war between Georgia and Russia in 2008. I decided then that I would come to Georgia as well. So really it is not about bookings or money, it is determined by the friends I know. That list of friends just gets bigger and bigger every different place I play at or see. What is different in people from UK and people from post-Soviet countries that come to your performance? To be honest there isnt much difference at all. I have now played 46 parties in the UK and 42 parties internationally so I have a good perspective on both. Maybe the only real difference is the different social cultures between the Ukraine and UK in that there is a much less drug culture (soft or harder) in Ukraine compared to the UK, but whether people take extasy or drink Ukrainian vodka makes no real difference. What things influence the success of good DNB party? To me it doesnt matter if there is 10, 50, 100 or 1000 people at a party. The key for me is did those people leave with a smile on their faces after. If they did then the DJs (and MCs) have done their job right! At the end of the day a DJ like me or anyone else is a performer there to entertain the people who come to a night. If I dont do that then I dont think I would get the bookings to play there again or in different places. What can you suggest to people who want to organize hot DNB party? Organising a party is a completely different game. I think the key is knowing your audience and their tastes in music. Drum and Basslines has not been an easy brand to run as even after 3 years of being here I am still not a Ukranian to know peoples likes or dislikes fully. But thats where I have enjoyed the challenge, and each Drum and Basslines party I learn that little bit more to make each party better than the last. I think the people who have been to each party would say they have seen the progress over the last year. Not long ago Dj from Spain said that “Ukraine is an exotic country for Europeans, almost like India, but not far away from Europe”. How can you comment this quotation? Can Ukraine claim to be a European country? 100% honest answer…. Ukraine is still very much a soviet style country, but it is gaining more and more things that are helping to make it more european every time I come. There is a long way to go but it will get there eventually if it really wants to! It is down to the desire of the people and the governnemt when and how long it takes for that to happen. A lot of people in UK are great fans of football. What do they expect from level of organization EURO 2012 Championship in Ukraine and Poland? Im a realistic person and have used this comparison for how well Ukraine and Poland will do at Euro 2012…. If China hosted the World Cup it would be facing the same challenges of international tourists coming to a place with a different alphabet and language. The issue is always money and time, and what value the money you spend will have for your country after the event. Yes you could spend billions to make everything perfect, but that money is wasted if it has no benefits to the country after. In the last year especially I have seen a lot of improvements in signs written in both Russian/Ukranian and English which will help tourists when they are here. Ukraine is not a rich country and people in the UK know that, so they dont expect it to be like a Spanish holiday resort with English cafes or shops. I think both Ukraine and Poland will do fine, and it also gives you a good opportunity to put yourselves on the map for English people to come back again and again. Is it important for a woman to wear fashionable clothes? Interesting question….. Ukraine is a country of extremes, cold winters and warm summers. Ukranian girls are the best looking ive ever seen in any country (add Belarus to that list as well). To me personally I dont look to see if they are wearing fashionable clothes, but it does make a girl look amazing if they are wearing something nice. Im most comfortable in a pair of baggy jeans, tshirt, hoody and a cap most of the time. I normally wear brighter colors as I think that helps project me as a happy person which I am. How can you describe your style? The best way to describe my style is comfortable, outgoing, and baggy. I guess that really says I like the skater/bmx style even though I’ve never been any good at skating! As a DJ that makes me an entertainer for people, therefore what I wear when I go out to visit a party or to perform is a reflection of happiness. If im enjoying myself then I hope that makes others do so as well. If im wearing all black then it would mean im in a bad mood or going to a funeral hahaha. When Im in the UK I buy most of my clothes on the internet through online shops. It means I get a much bigger choice without walking around 50 different places to find what Im looking for. The choice of online shops is huge in the UK and means I can get something thats maybe just a bit different from everyone else. When I am over here in Ukraine then its slightly harder for me to find what Im looking for, but your outdoor markets (which I saw more in Belarus compared to Ukraine) are full of interesting stuff and i have picked up a few baseball caps and hoodys from over here. What brands do you like most of all? For trainers (you probably call them sneakers) I tend to go for Nike as they have so many styles and colours to suit whatever else I may be wearing, and they are also comfortable. Maybe 10 years ago I would have 20 different pairs of trainers in different colours so I had something to match. Nowadays I go for plain colour trainers which is much simpler. As I travel a lot it also means I have less to put in a suitcase! As far as other brands, I like DC for both trainers or clothes, Animal has some interesting clothes, Firetrap, Quicksilver and Billabong make some cool hoodys and caps. The important thing for me is not the brand name, but to have something more unique than other people. How can you rate Ukrainians’ fashion so far? People that you saw in Ukraine are fashionable? In general I think Ukrainians are a bit more reserved in what they wear especially in winter. When I walked around Kyiv during the winter all the guys wear almost identical black coat, black hat and dark jeans. The only way to tell people was by how tall or short they are hahaha. The women of Ukraine however are a lot more outgoing in what they wear in the winter and the fashions are different to the UK, but the weather conditions demand a more practical approach. In summer it is a bit different and people liven up a bit and the fashion is more similar to the UK, although it has to be said Ukrainian girls are much better looking than the UK and they styles here suit that perfectly! The male football fans who come to Ukraine for Euro 2012 will LOVE Ukrainian girls !!! Interview by xzybin. Thanks for the help Vo1 Acidoff and Olga Kozlovskaya. We are always looking out for fresh and different talent to perform at our parties as it keeps us unique, and ahead of the game. We are here and showing the world that there is a different way to have a good time that doesnt stick to an old formula, but breaks boundaries, and takes things to the next level, with a new generation of stars.